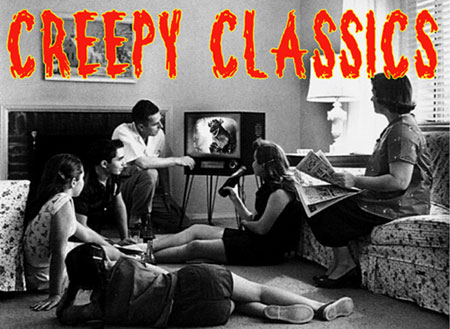 A young boy gets locked in a school after hours and see ghosts re-enact a murder from 1962. It's only the beginning of a supernatural mystery. A classy ghost-horror film, beautifully photographed. Includes two discs, release feature and director's cut, commentaries, packed with extras. Stars Doug McClure. A German submarine in World War I takes British prisoners and through a twist of fate, surfaces in a lost land of dinosaurs. Hidden away and protected from the elements and disasters that killed the prehistoric beasts. A Samuel Arkoff special from the late seventies! Stars Roddy McDowell. One of the scariest haunted house movies ever made. It's right up there with the original HAUNTING. McDowell is REALLY effective as a world-weary soul who knows the house and what it can do. Really frightening stuff. Fangs and flying fists in this vampire/martial arts movie. Drive-in heaven with Peter Cushing too! New scan of original film elements. Audio commentary. Alternate US version as well as the original. TV spot, still gallery, theatrical trailer -- packed! Alfred Hitchcock directed this classic. Stars Tallulah Bankhead, William Bendix, John Hodiak, Heather Angel, Hume Cronyn, Henry Hull and Canada Lee. A ship is sunk by a Nazi sub and survivors end up on a lifeboat together...and the Nazi Captain that torpedoed their ship. Intense supense. Extras! Restorded BW and colorized version of this Roger Corman cult classics. A boy and his dog...errr, no...his plant! A chomping giant man-eating plant relies on his human friend Seymour to find him fresh meat. Still strange. "Feed me Seymour!" See Jack Nicholson in his first role! Laird Cregar is outstanding as Jack the Ripper in this classic horror. Also stars George Sanders and Merle Oberon. Extras include commentary by Greg Mank, The Making of THE LODGER featurette, THE LODGER radio show starring Vincent Price, trailers and more. An accused witch burns in a medieval village. Of course, that's not the end -- only the beginning of the horror. Death, madness and creepy atmosphere with great sets, apparently a real European castle. In Italian with English subtitles. Stars Barbara Steele. Crystal clear print! The silent Sir Arthur Conan Doyle story of Professor Challenger heading an expedition into darkest Africa to bag dinosaurs. Great effects (INCREDIBLE for the time) by Willis O'Brien, who did the stop motion for KING KONG. This is the beautiful edition with loads of extras!